Paragon Studios performed May 5-6 at the Ohio State Baton Competition at the Nutter Center, Dayton. The group had 51 wins, including 39 individual wins. 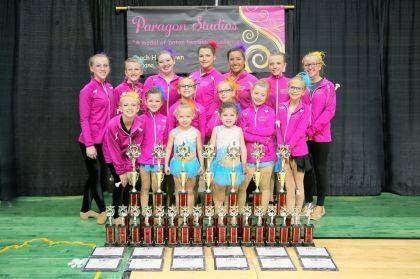 Paragon had 20 girls competing in the state competition this year. Paragon Studios is owned by Holli Brown, Urbana. Shown are, top row from left, Telanei Brown, Jessica Rooney, Cori Kent, Calle Manzi, Kiki Zizzo, Paige Deere, Andi Marland, bottom row from left, Sevonei Brown, Bella Miller, Elaei Brown, Phoebe West, Bella Huffman, Layla West, very bottom, Ally Shaner and Scarlet Miller. Missing are Allayna Serr, Bella Serr, Raegan Serr, Shai-Anne Settle and Jocy Holtsberry.